We live our values every day. 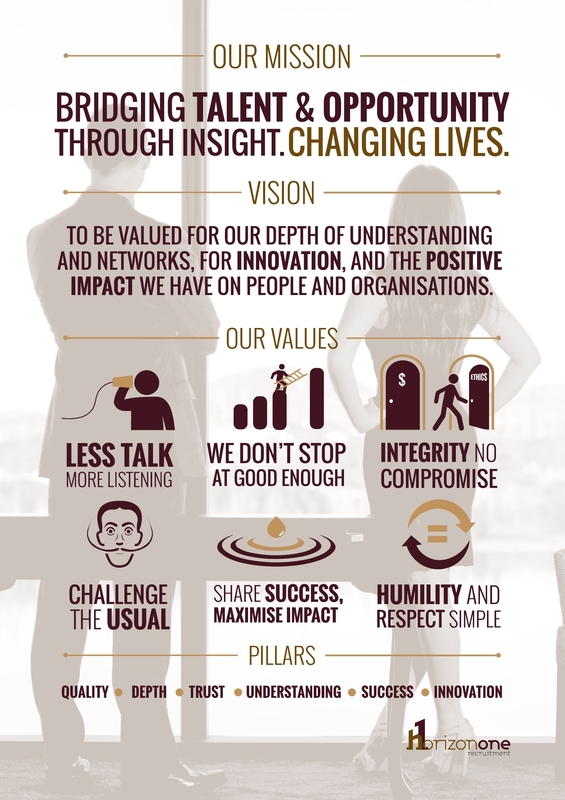 Our values are not simply words in a business plan, or ideals on the wall. We apply them to everything we do each day, and they are built into every facet of our operation. HorizonOne’s focus is quality and we continually strive to raise the benchmark for excellence in our industry. The top 15% of talent in the market is our focus, and we invest significant time and resources to deepen our understanding of what motivates and drives their behaviour. Our screening and evaluation process is the most advanced in the industry. From our internal staff selection, to candidate sourcing and selection, client account management and internal controls and due diligence, everything is centred on quality frameworks designed to deliver high-value outcomes. Our success in winning market share. In our first 10 year’s of operation we have managed over 6800 job orders from over 2200 different contacts in over 460 different organisations. We offer you access to a depth of talent networks not seen through our competitors. We build ‘talent communities’ in our specialist areas that are advocates for our brand. The talent we represent are the best in the marketplace, and we love sourcing our clients ‘game-changers’. We offer you access to our extensive referral networks as well as thousands of loyal repeat candidates. Pre-vetted and often with a track record of success working through HorizonOne or our clients, our candidate communities are our lifeblood. We have a strong track record recruiting Nationally including for clients in Sydney, Brisbane and Melbourne. We also offer you extensive access to National Networks through 45 affiliated agencies in a network that holds over a million candidates in its shared database. We offer you a mature consulting team with over 93 years combined experience in the recruitment industry, and we are supported by a crack team of administrators, contractors and scribes. We are true subject matter specialists with each consultant focussing on their own area of subject matter expertise and building deep candidate networks for you to access. True specialisation leads to a genuine depth of understanding so we can not only give you up to date market intelligence, but we can also add significant value to your decision making around people. We conduct the most comprehensive job briefs in the business, and we customise our solutions to your needs. We continually strive to build our understanding of you and your organisation. We thrive on hard to fill specialist roles, the more challenging the better. We don’t give up! Our approach to recruitment is consultative, and we won’t ‘sell to you’. We work with our clients towards long term, mutually beneficial partnerships where we can act as trusted advisors offering value-add advice. We combine cutting edge recruitment methodology with a commitment to ‘old school’ recruitment professionalism. We are honest, authentic and ethical with a firm commitment to providing the very best client experience. We view sourcing talent as a Science, not a sales game and we are continually seeking ways to better understand and connect with our networks. Our core values of ‘Challenge the Usual’ and ‘We don’t stop at good enough’ set the scene for a team that loves to shake it up. We focus our search and sourcing techniques in order to identify ‘unique talent’. We connect our clients with previously unseen high performers, those elusive and often passive candidates that are snapped up as soon as they are active in the market. These candidates often work exclusively with HorizonOne. We are continuously finding new ways to share our knowledge, share our Insight, and give you immediate access to our best talent when you need them. We look forward to sharing some truly unique advancements in candidate sharing with you in the coming years. Over 70% of our contractors extend or go permanent. Less than 5% of permanent recruitment for large organisations requires replacement. HorizonOne’s success and rapid growth has been built on foundation of trust and a reputation for delivering quality results. We care about making a difference in our community, and we engage our clients in these activities to maximise our positive influence. We support a range of community organisations by leveraging our success to maximise positive impact.